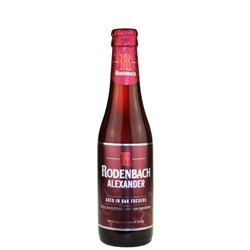 Rodenbach Alexander (ABV 5.6%) from Rodenbach Brewery is a mixed fermentation beer consisting of two thirds beer that was matured in oak casks for 24 months and one third young beer; the blend is then subjected to maceration with sour cherries. This extraordinary, limited-edition beer with its unique, balanced palate, complex finish, and subtle fruit and wood notes is undoubtedly one of Rodenbach's best sour ales. It was brewed for the first time in 1986 for the 200th anniversary of Alexander Rodenbach's birth* and is now back by popular demand. Its aftertaste is reminiscent of a Burgundy wine and its freshness makes this beer the perfect aperitif or accompaniment to cheeses or dessert. Ratebeer.com rating: 100 (out of 100)! 11.2 oz capped bottle. * Alexander Rodenbach was born on 28 September 1786 in Roeselare. This extraordinary man, who became blind at the age of 11, was a born entrepreneur with great determination. He managed the Rodenbach brewery from 1821, but also worked as a writer, a member of parliament, and mayor of Rumbeke.